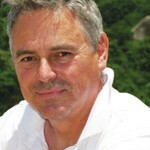 Please welcome for September 2013 Author of the Month Michael Tellinger, whose new book African Temples of the Anunnaki -The Lost Technologies of the Gold Mines of Enki, provides Archaeological proof of the advanced civilization on the southern tip of Africa that preceded Sumer and Egypt by 200,000 years. The evidence also shows how these 200,000-year-old sites perfectly match Sumerian descriptions of the gold mining operations of the Anunnaki and the city of Enki. Join Michael during September on the AoM Message Boards and become part of the discussion. The history of southern Africa is one of the great untold stories of the world. It has remained a guarded mystery by traditional knowledge keepers and African shaman for thousands of years. But in 2003 everything changed with the accidental and serendipitous discovery of an ancient stone calendar that caused a chain reaction of events, which led us to decoding one of the greatest missing pieces regarding our human origins and the activity of the Anunnaki on planet Earth. Many history books and scholars have told us that the first civilisation on Earth emerged in a land called Sumer, some 6000 years ago. This Sumerian civilisation left behind a detailed account of human activity in millions of clay tablets that continue to reveal critical human behaviour and outlines the relationship between the Anunna gods and the people of Sumer. But our archaeological discoveries that began in 2003 suggest that the Sumerians may have inherited much of their knowledge from a civilisation that emerged many thousands of years earlier in southern Africa, already thought to be the cradle of humankind. These discoveries also suggest that the same deities, who have become known as the Anunnaki through the works of Zecharia Sitchin and many others, were also very active in the lives of the people of southern Africa, more than 200,000 years ago. In 2003, a strange arrangement of large stones that were neatly planted at the edge of a cliff near the town of Kaapschehoop, South Africa, was spotted by Johan Heine from his aeroplane. After returning to the spot the next day to see the site on the ground, he instantly realised that this was no ordinary, nor natural arrangement of monoliths, and so began a process of measurements and calculations that lasted several years. His meticulous analysis clearly shows that this was an ancient calendar that is aligned with the movements of the sun, solstices and equinoxes, and that we can still mark every day of the year by the movement of the shadows cast on the flat surface of the calendar stone at the centre of the site. But as it is with many ancient sites, including Stonehenge, the calendar aspect is not the main purpose of this structure, but merely a crucial feature built into the site. We have discovered deeper and more mysterious functions that only became apparent after many electronic and scientific measurements several years later. 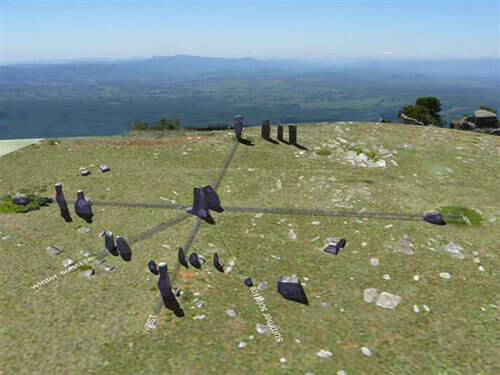 Through its alignment with the stars and the movement of the sun, this African Stonehenge that I named ‘Adam’s Calendar’ has for the first time created a link to the countless other stone ruins in southern Africa, and suggests that these ruins are much older than we initially thought and forces us to start rethinking the activity by early humans in the so-called “Cradle of Humankind”. The discovery of this calendar site was nothing new to Johan Heine, who had already spent at least 15 years photographing mysterious circular stone structures scattered throughout the mountains and valleys of southern Africa. These circular stone ruins have become affectionately known as the “stone circles” and they lie scattered in large clusters throughout the entire sub-continent that includes South Africa, Zimbabwe, Botswana and parts of Mozambique. The complex that links Nelspruit, Waterval Boven, Machadodorp, Carolina, Badplaas, Dullstroom and Lydenburg, and has a radius of approximately 60 kilometres, covering an area larger then modern-day Los Angeles, has emerged as the largest and most mysterious ancient city on Earth. The discovery of a bird statue that resembles Horus carved out of dolerite, a small sphinx about 1,5 metres long carved out of the same dolerite rock, a petroglyph of a winged disk, many carvings of Sumerian crosses in circles and an ankh in a radiating circle suggest that the prototype Sumerian and Egyptian civilisations had their origins in southern Africa thousands of years before they emerged in the north. After meeting Johan Heine in early 2007, he invited me, along with a large group of the most senior scholars in the field of archaeology, history and geology from several South African universities, to experience the spectacular vista of the ruins from a helicopter, an event that spanned an entire weekend. Though this was an incredible opportunity of a birds-eye-view of the stone circles, on the day of the event, I was the only one to arrive. And so, I alone gained new perspective and became the one that carried the torch of future research and investigation. Six years of research by a group of independent scientists and explorers has delivered what may be the crucial missing elements in our understanding of the lives and development of early modern humans. Our discoveries have been noted in two books – Adam’s Calendar and African Temples of The Anunnaki and will be updated in the soon to be released The Lost City of ENKI. But the research has also shown that these stone settlements represent the most mysterious and misunderstood structures found to date. It points to a civilisation that lived at the southern tip of Africa, mining gold for more than 200,000 years, and then completely and suddenly vanished from the radar. We may be looking at the activities of the oldest civilisation on Earth. Little did I know that when I named the newly discovered stone calendar “Adam’s Calendar” how close to the truth I would be. This was only revealed to me by the preeminent Zulu Shaman Credo Mutwa some 2 years later, when he told me that he was initiated at the site in 1937 as a young shaman, and that this site is known to African knowledge keepers as Inzalo Ye Langa, or “Birthplace of The Sun”, where “heaven mated with mother earth” and where humanity was created by the gods. But Credo went even further in his detailed explanation of the deep significance of the site when he explained that it was not just any god of the ancient times that created humanity, but specifically a deity that is know in Zulu as “Enkai”, the same deity know as ENKI in the Sumerian texts. This throws a whole new spin on our understanding of the Anunnaki on Earth and the “fingerprints” they left not only on ancient stone ruins but also the genetic manipulation and creation of the human race. These fingerprints have now been very clearly exposed in our genetic makeup by the brilliant work of William Brown, a molecular biologist and geneticist of the highest order who is part of the research team of Nassim Haramein’s Resonance Project Research Foundation, on the island of Kauai. After surveying Adam’s Calendar, it turned out that the north, south, east, west alignment is out by 3 degrees – 17 minutes – 43 sec in an anti-clockwise direction. This may be a critical discovery regarding turbulent times in antiquity because it irrefutably proves that the earth’s north-south alignment today, is not where it was when the calendar was constructed. It irrefutably proves that our planet has undergone a crustal displacement, or something along those lines, taking the north-south pole alignment with it. The theory of Crustal Shift or Crustal Displacement was proposed by scientist Charles Hapgood and strongly supported by Albert Einstein. Adam’s Calendar gives us the geophysical proof that such events did actually occur. What we do not know however at this stage, is when this shift happened. Mysterious ancient ruins of southern Africa. Until I started my research in 2007, it was generally accepted by scholars that there are about 20,000 ancient stone ruins scattered throughout the mountains of southern Africa. Modern historians have been speculating about the origins of these ruins, often calling them “cattle kraal of little historic importance”. The truth of the matter is that closer scientific inspection paints a completely different and astonishing new picture about the ancient history of these stone ruins. The scientific reality is that we actually know very little about these spectacular ancient ruins and it is a great tragedy that thousands have already been destroyed, and continue to be destroyed through sheer ignorance by power lines, forestry, municipalities, farmers and new housing developments. After my personal explorations on foot and by air over the ruins, I confidently estimated the number of ancient stone ruins to be well over 100,000. This figure was confirmed by Prof. Revil Mason in January 2009. But after doing an extensive count on Google Earth and other aerial photographs I concluded that there are at least a staggering 10 million of these circular ruins. The mystery deepened when I found out that they have no doors or entrances in their original form and therefore could not have been dwellings. They were all originally connected by what we now call channels – (which our history books call roads that tribes drove their cattle on) – and are also surrounded and connected to an ongoing grid of agricultural terraces that cover more than 450,000 square kilometres. This clearly points to a vast vanished civilisation who grew crops on a gigantic scale. This immediately poses a huge problem for archaeologists, anthropologists and historians because the accepted history of this part of the planet does not at any time in our past place anywhere nearly enough people here to have built this number of structures. It gets even more complex when you realise that these were not just isolated structures left behind by migrating hunter-gatherers, but a giant complex of circular structures all connected by the strange channels and suspended in a never-ending web of agricultural terraces. If we were to assume that these were dwellings, it would suggest a population of at least 10 million people – which is unimaginable to most of us today. It is important to note that the mysterious ruins of southern Africa, which include Great Zimbabwe and millions of similar ruins in that country, also extend into neighbouring areas like Botswana, Namibia, Zambia, Kenya and Mozambique. But why were these ancient people here in the first place? What were they doing? The past 200 years has seen a number of explorers write in great detail about these ruins, but their findings have been largely forgotten and their books are out of print. Most of these early explorers write about thousands of ancient mine shafts found in close proximity to these ruins. In fact, most of these mines have been described as gold mines, copper, tin and iron mines. In my personal experience and research I have found at least 25 ancient mine shafts in gold-rich areas and been told about dozens more by farmers all over South Africa. Ancient mines covered by 30 metres of soil have been reported by at least 2 miners in the ‘30’s in the province of Limpopo and more than 75,000 mines have been reported by geological companies in Mpumalanga. It seems that gold mining has been going on here for a lot longer than most of us ever imagined. Ann Kritzinger, a geologist from University of Zimbabwe has shown in several papers that many of the ruins in Zimbabwe were most likely for the purpose of extracting and purifying gold – and were not slave pits, animal pits or grain pits as is often suggested by ignorant scholars. The links to the Sumerian civilisation in southern Africa simply cannot be ignored or erased. They can even be traced with etymology in the names and origins of indigenous people. The most obvious evidence are the mysterious origins of the word “Abantu”, the name commonly used to describe black South Africans. According to Credo Mutwa, the name is derived from the Sumerian goddess Antu. “Abantu” simply means the children or people of Antu. Extensive electronic measurements in 2011 have shown that the circular stone ruins are in fact energy generating devices, using the natural sound that emanates from the surface of the Earth, creating electromagnetic fields as a result of the sound amplification. The shape of the circular ruins are all very specific and unique because each circle represents the cymatic pattern of the sound energy as it appears on the surface of the earth at that point. This energy was amplified by a simple understanding of harmonics and utilised in the same way that we generate LASER and SASER beam technology today. Giant magnetron-shaped structures suggest that this was well understood by the ancients. I have measured these spectacular energies and electromagnetic waves and therefore do not hesitate to make these claims. Some of the sound frequencies go into the extremely high Giga hertz levels (over 380 Giga hertz) which are unheard of on Earth today in any normal application. The fact that these circles are all connected by the stone channels makes it very clear to any scientist who works with electricity or energy that the stone circle complex is a giant energy generating grid that was most likely used in the mining and processing of gold on a scale unimaginable to us today. This is a critical aspect of my research and there are several methods that I have had to resort to because we cannot use carbon dating to establish the age of stone. Neither can we assume that pottery or other artefacts found in the ruins were left behind by the architects. The many tools and artefacts that I have collected for my small museum in Waterval Boven are very unique and very mysterious – all made out of stone. They all seem to display strong acoustic properties and I call them “stones that ring like bells”. This was the realisation that led me to discover that sound played a critical role in the building of the ruins and the use of the energies that they create. One of the most obvious techniques I use in determining the possible age of the tools, is the patina growth that forms on the rock. The kind of patina or skin that grows on these artefacts, grows at a very slow rate that is estimated to be about one thousand years per microscopic layer. In other words, by the time that the patina is visible to the naked eye, it is already a few thousand years old. Most of the artefacts in my collection are completely covered in patina several millimetres thick, suggesting that these ancient tools must be well over 100,000 years old or even substantially older. In conclusion, we are standing at the threshold of a brand new discovery that will expose great surprises and unveil a great hidden part of human history. My new book UBUNTU Contributionism – A Blueprint For Human Prosperity should be released by the end of September 2013 and I am completing the follow up to African Temples of The Anunnaki that will contain all the latest discoveries and conclusions I have reached regarding the vanished civilisations of southern Africa to date. An aerial view of the calendar site perched on the edge of the Transvaal escarpment consisting of black reef quartzite. The tree on the right is the north marker – the tree on the left marks south. All the monoliths that make up the circular calendar structure are dolerite. We do not know where the dolerite comes from. Note the sculptured pointed monolith closest to the edge. This is one of the 3 fallen monoliths that aligns with the rise of Orion’s belt. Johan Heine shows us the shadow that moves from left to right of the calendar stone, allowing us to mark the days of the year, from the summer solstice on the left edge, to the winter solstice on the right edge. A close-up view of the Adam’s Calendar, showing that the north-south line dissects the two central calendar stones. The tree in the centre is where the north marker stone is located. This monolith at Adam’s Calendar was removed from its original position in 1994 where it stood looking at the sunrise on the equinox over the large central monoliths. It now serves as a plaque stand at the entrance to the nature reserve. Although it is badly eroded, the original circular form of the calendar site can still be seen on this satellite image, with the 2 main monoliths at its centre. The north-south deviation can also be immediately seen as the north marker slants slightly to the left of 12 o’clock. It was measure do be 3 degrees, 17 minutes and 43 sec. One of the many mysterious ancient stone ruins that seems to have a greater purpose in its design. The Phi factor of 1,618 seems to be well used in this and other structures’ dimensions. A small section of the ancient energy grid that stretches more than 450,000 km square linked by the ancient channels that can be clearly seen from the air. This kind detail is not at all visible to observers on the ground. Ancient terraces surround large complex structures and cover more than 450,000 km square.